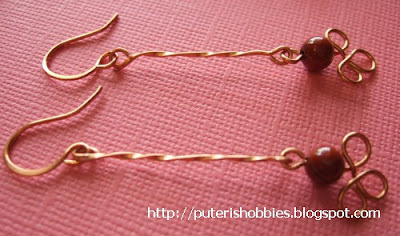 I am still learning about wire jewelry and these four pairs of ear-rings were made with silver and copper artistic wire. 20 gauge half hard sterling silver is a little too hard for me and it doesn't bend easily. Instead I used artistic wire for the fancier wire work. My next purchase will most definitely be a dead soft 20 gauge. 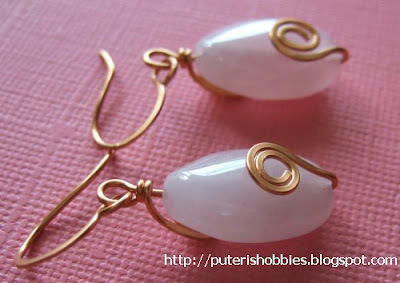 Copper is soft and pliable and fun to work with. The twisted link with the red bead turned out better than I expected. 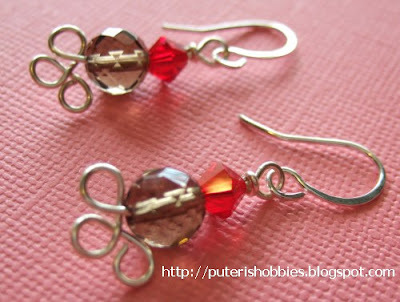 It is great that I can now make my own ear-ring hooks! I used to spend quite a bit on sterling silver hooks but with the wigjig I can make better shaped hooks than those I attempted free hand. they look fantastic Puteri. :*) I like the first one. Do you sell them online? Thank you! 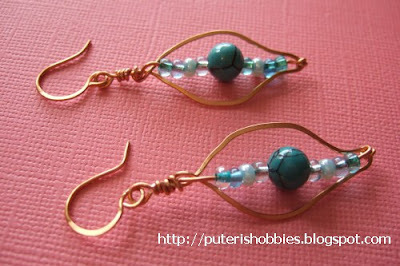 I bought several bead and wire jewelry books .... just to learn how to do it! I have toyed with the idea of selling them online like what you are doing at etsy, but when I see the large number of jewelry sellers there, I am not sure if it will be worth my time!